Accredited Program: Our New Cumberland kindergarten program is held to the rigorous standards of the Pennsylvania Department of Education and the Pennsylvania Keystone Stars program. Our program is lead by teachers who have Bachelors degrees in Early Childhood Education and teaching certificates from the Pennsylvania Department of Education. Our Philosophy – Your child’s first educational encounters will influence their attitude toward all future learning. We endeavor to make each child’s first formal learning experiences positive and rewarding. By nurturing each child’s special talents, we strive to create a love of learning and a love of self. 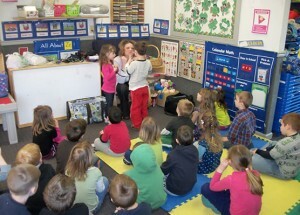 Learning and Sharing’s Kindergarten program is licensed by the Department of Education. The curriculum is well designed in conjunction with the local school district’s kindergarten programs to help each child prepare for first grade and beyond! Individualized Learning – One of the major benefits of our kindergarten program is the level of individualized instruction and care your child will receive from our degreed and teaching certified teachers. Our ratio for our Kindergarten program is 1:9, which is significantly lower then many other Kindergarten programs and the public school system in our area, where ratios can be as high as 1:25. Awareness of the World Around Us – Children will learn about the family, school and community and the role each plays in their lives. Literature and Language Experience – Creating interest in reading is important and is encouraged through stories, poems and plays. The will increase as they begin to notice familiar letters and words in them! Storytelling will build listening and recall skills, too. We utilize the KidWriting Program to allow children to begin writing creatively. Reading Readiness – Children in kindergarten will learn to recognize the letters and reproduce the sounds of the alphabet. A Sight Word vocabulary of 80-100 words will be introduced. Math Skills- The children will explore counting, measuring, sorting, classifying and basic graphing. They will learn to recognize and reproduce numerals and begin the basic operations of addition and subtraction. The children will also begin learning about how to tell time and coin/dollar values. Math Expressions curriculum is used. Math Skills – The children will explore counting, measuring, sorting, classifying and basic graphing. They will learn to recognize and reproduce numerals and begin the basic operations of addition and subtraction. The children will also begin learning about how to tell time and coin/dollar values. Math Expressions curriculum is used. Science and Social Studies – Many different subject areas will be covered and explored under these headings. The children will participate in basic science experiments and learn the how and why of the world around them. Throughout the year, different cultural and diverse topics will be discussed in the child’s social world. Physical and Social Skills – We will build on the fine motor skills and eye-hand coordination necessary to manipulate writing utensils, paint brushes and scissors. Varied gross motor games and activities will aid in large muscle development. As your child grows more independent, we continue to foster appropriate social behaviors—responsibility, respect for others, cooperation, sharing and courtesy. Arts – the children will express themselves through a variety of media, including paint, chalk, crayons, paste, scissors and much more! Music will fill the air daily as we explore many rhythmic and singing adventures. We will develop appreciation of different kinds of music too!